IMO is an advanced high-quality video and voice chatting application. It is light-weight in size & performance wise. Additionally, its features include new awesome stickers and group chatting. This is better alternative to Skype. Here is a complete review of this app which is worth reading. 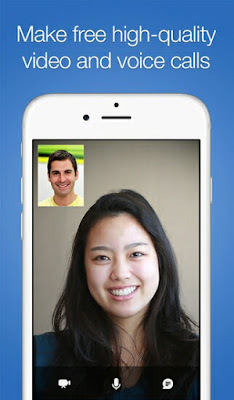 If we talk about video chatting application then from day one, Skype is at number one position. It is one of the oldest application launched back in 2003 by Microsoft corporation developers. Now it is available in almost all platforms including Android, iOS, Linux, Blackberry and many more. Being a long time user, I found various bugs (or you can also call them technical errors) in this application and the worst part is the login problem. Due to this reason I started looking for other better alternatives. One of my friend suggested me to use IMO Android app. Speaking frankly, I never heard this name before in my life but what I have to lose to give it a one try? Then after few days, I downloaded the app from Google play store and really, I was impressed with the features it offer. Soon I realized that this app need to reach more audience and that's why today I am going to review it. Oh! Don't think that I will paid for it. This post is not associated with any affiliate program. Actually this is my personal report which can help to give better dive in IMO app features. First of all, start with creating a new account. As much as I know, this app is available for Apple and Android users only and you can download it from there respectively app stores. I think you don't need any explanation on how to install it. After getting into app, you can easily create your account using your mobile number. Interesting thing is, you don't need to use your E-mail address and password for signing up, which is mandatory in case of Skype. Simply add your phone number and they will send an OTP password via SMS to verify your identity. It would be a 4-6 digit number. After entering it in required field, you've to write your name and other personal details like DOB, gender, profile picture etc., Finally you'll be in your new IMO account and this all thing will hardly take your 2 minutes. There are number of features in IMO and below I had discussed few of them. Few MB application size: Can you imagine an android app with less than 6 MB size and that too for video and voice calling application? Of course not. But the truth is, IMO is just 5.3 MB in size. Even after installing, it will hardly occupy your 20 MB phone memory. On the other hand, this app creates very few cached files. Indirectly, this means that it will not affect your phone performance and hence you'll not find any slow down in its speed. 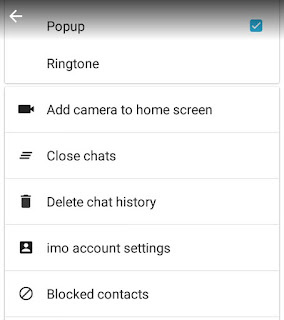 Chatting feature available: As like you chat in WhatsApp, you can also use IMO to chat with your friends, family members and colleagues. 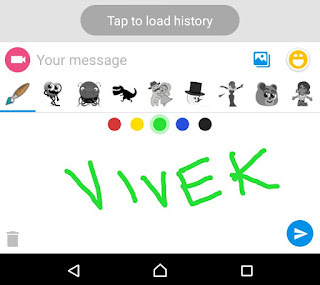 You can share text, images, smileys, stickers and videos with them. It will automatically show the list of the all people who are using IMO and thus you can contact them. Moreover, if they don't have IMO then you can also invite them to download it. 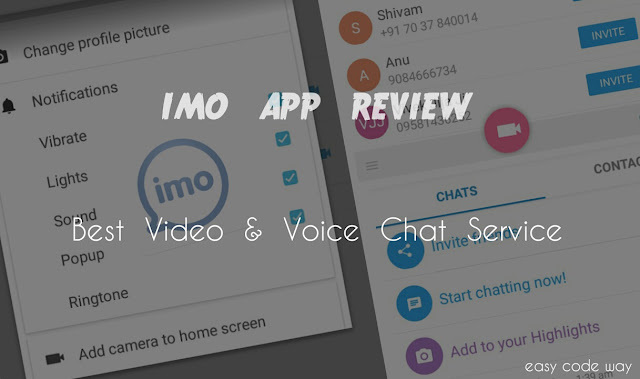 High-Quality video and voice calls: Basically IMO is made to connect people from all around the world with video and voice calling service. You can do video chatting with your loved ones. Of course, this only applies internet charges and you'll not find any deduction in your balance. Although, quality depends on internet speed but to many extent, IMO provides more than average quality experience in low 2G connections also. Group chatting: You can create your own group to chat with more than one person at a time. This feature is similar to WhatsApp groups. You can easily share text, images and videos with group members. Though you can't do video chatting with all group members at once. This is one of the major drawbacks here. Hope that IMO developers will add this feature in upcoming updates so that people can also enjoy online video conferencing with it. More control over settings: Inside your IMO account, you have full control to change any account settings including notifications preference. Additional, you can delete chat history, add any person to favorite list and block any contact. Now I just hope that you've complete knowledge about this IMO app. As we all know that coins have two parts so in the same way, this app also have some pros and cons. Lets have a look at each part! Finally it's your turn to try this app. Go and download it now. So that's all for today guys. If you've any question, please let me know in below comment box. Stay connected, Stay blessed!